The STAR Puppy Program is for puppies who have received their second set of shots and are up to 5 months of age when registering. If your puppy is a small breed up to 7 months of age when registering is appropriate for this class. The program runs for 12 weeks, one hour a week. Upon completion your puppy will have been exposed to training through puppy preschool and beginning obedience plus MORE! Cost is $260. The first class is without puppies, for orientation and a question and answer session. 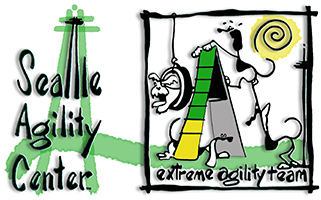 Seattle Agility Center's Dog Obedience Studio recognizes the importance of starting puppies RIGHT during their first six months. We offer a 12 week, one hour a week program for you and your puppy to do just that! As a loving dog owner, your goal for your new puppy is to provide positive early training so your puppy becomes a reliable family member that can participate freely in activities in the community with your family. That is the important foundation the STAR Puppy Program provides to you and your puppy. Socialization: Proper socialization of puppies up to 6 months of age is critically important to an adult dog's permanent temperament. The most common cause of unprovoked dog aggression is lack of proper socialization. STAR Puppy Program provides this critical supervised play time each week. Because the program is 12 weeks long, this adds 5 weeks of play to a regular 7 week puppy class. In addition to puppy socialization, the STAR puppy program allows your puppy to interact with other people members of the class. There is HAT day, when all people members wear silly hats to accustom your dog to new sights. Puppies are exposed to noises and visual surprises such as people on crutches, shopping carts, walkers, etc. All these experiences are valuable when creating a rich environment for socialization. Training: The first 6 months of your puppy's life and how you interact with the puppy sets the tone for a healthy lifelong relationship. Knowing how to set and enforce boundaries for biting, jumping, crate training, potty training, and all the other puppy behaviors that need attention is critical. The more constructive learning a dog does during this time, the more complex the task the dog is capable of learning throughout its lifetime. The basic obedience skills and behavioral training presented in the STAR Puppy Program creates an unbreakable bond of mutual respect between you and your dog. In additions to obedience exercise such as loose leash walking, sit and down stays, coming when called (and wouldn't THAT be nice!! ), waiting at the door, etc, tricks are introduced as well using clicker training. If you don't give your dog a job they will become self-employed. Tricks are a great tool to engage a bored puppy on a rainy day. Activity: For physical and mental health both dogs and people need to be physically and mentally happy. In the STAR Puppy Program you will learn about the wide array of activities available to dogs and their owners in our area. These range from tracking to agility-swimming to herding. Responsibility: The final step of the STAR Puppy Program is the S.T.A.R. Puppy test sponsored by the American Kennel Club. This program is for purebred and mixed breed dogs and is an acknowledgement to responsible owners who have taken the time to create a positive foundation for their puppy, including training, socialization, medical care, exercise and housing. It is the Puppy equivalent of the AKC Canine Good Citizen Test. Upon completion of the STAR Puppy Program your puppy will take the S.T.A.R. Puppy test and will receive the AKC-STAR Puppy Medal and will be listed in the AKC-STAR Puppy records. In addition you will receive the AKC Star Puppy Package from AKC. Note: You will send the completed test to AKC with $10.00 to receive the above items. You want the best for your puppy and so do we! Join us in our STAR Puppy Program. Visit our schedule page for the latest class times.